A door consisting of a frame and rectangular glass panels. Also known as a French Window. Many times hung in pairs on an external wall leading to a patio or verandah. 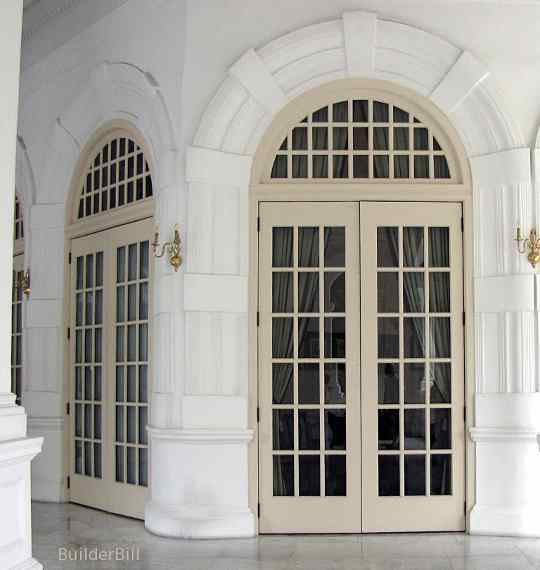 French Doors : Handsome sets of doors seen at the brilliantly restored Raffles Hotel in Singapore. I scratched my head a bit when deciding the title of this page. I could have just as easily used the term French Windows, because they are just as often called that. The glass is the important thing. Within the restrictions of type of construction that is used as much glass as possible seems to be the point of these doors/windows. They have also been described as casement doors or casement windows. When they are made out of wood, like the ones shown here then the stiles and rails, particularly the bottom rail have to be a certain size to provide adequate strength. However this door type is very popular now in other materials which do not need bulky frames. PVC and aluminium come to mind.